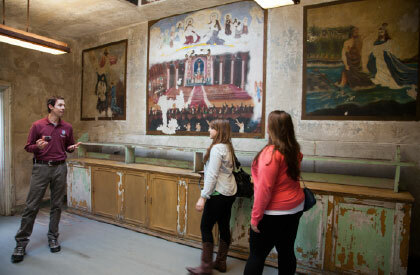 Murals in Philadelphia’s Eastern State Penitentiary. On a recent Sunday afternoon, my husband and I were looking for something fun to do with our daughter Susie and her friend David. It was raining, so plans to stroll the local arboretum were tabled. Susie is an avid advocate for prison reform and delighted to explore historic Eastern State Penitentiary (ESP) in Philadelphia. I mostly wanted to see the historic architecture and learn a bit of history in a nice low-key way, without undue challenge to my comfortable suburban mindset. I wasn’t disappointed in my quest for fascinating architecture, but our first steps inside quickly told me this would be a challenging afternoon. As one of the first “penitentiaries” in the early 19th century, ESP’s mission was to rehabilitate prisoners in order to make them penitent and therefore fit for society. 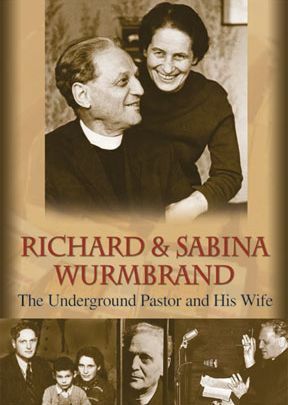 If you’ve read issue #123 of Christian History, you know that ESP developed what became known as the “Pennsylvania System,” whereby prisoners were kept in solitude and silence to reflect on their mistakes and repent. One look at the impossibly high, cold, stone walls and the rows upon rows of crumbling cells told me this was a desperate place, not one that would inspire penitence. Further, the former prison was exhibting art, poetry, and videos made by hundreds of former and current inmates. As the physical structure spoke of the haunting reality of past prisoner experiences, the art exhibition broke our hearts with more recent stories. Was there no hope for those who found themselves incarcerated? It turns out there was. Near the cell of famed mobster Al Capone is the chaplain’s old office. Stepping inside, we found a stunning change from the rest of the prison: the walls were covered in colorful religious art. Our guide unfolded the story of Lester Smith. Convicted of armed robbery, Lester had a dramatic conversion to Christianity following a vision or dream. He awoke with a strong urge to paint the crucifixion and other images. Lester began painting in his prison cell and was soon discovered by a Catholic chaplain, who asked the self-taught artist to paint the walls of his office. Lester spent one year (1955) at ESP, painting 23 vivid murals depicting his spiritual transformation. He signed each mural “Paul Martin” to honor his two favorite saints and perhaps to keep his own identity secret. Though much of his work has been lost to decay, one mural that has been restored shows Lester kneeling at confession. It’s safe to say that Lester Smith found repentance inside a prison, but it seems he found it in spite of the surroundings, not because of them. His warm and colorful paintings are a powerful reminder of hope in a dark place—of the possibility of redemption against all odds, and of a redeemer who seeks us out in the forgotten depths of despair. I’m glad I found more than interesting architecture during my visit to Eastern State last spring. Thank you Lester for sharing your faith with us through your art!